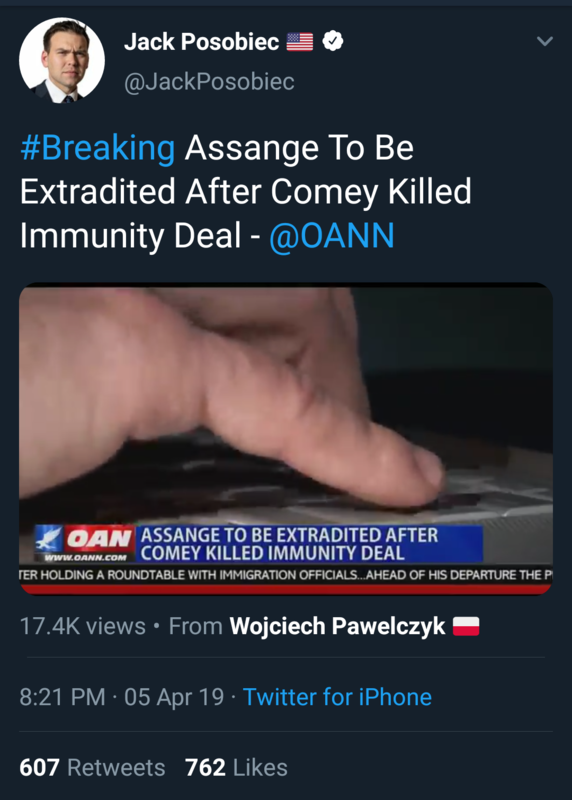 And Q has been silent in that same time span. Q's last post also occurred the day before reports that he had been "outed". Oh well, it's up to the Department of Justice to make Qsters genuinely happy now. More info from Q at this point would perk people up, but that "high" wears off faster each time now. I know it's Jack but the info sounds plausible. Trump admin had a deal to give Assange immunity in which he wouldn't release vault 7 etc. Comey and dems found out spoke to Assange's legal team told them deal was off. Pompeo came out and declared Wikileaks a hostile foreign intelligence entity. Also the paper plane incident when ppl thought he escaped, I heard a couple of rumors both relating to a planned escape one story says it was Russia the other says it was Trump admin. Both stories end with it being too risky and it's called off. I'm pretty sure he's still in there. The Adam Schiff threat against the President's family is akin to Chuck Schumer telling President Trump that the Intelligence Community would "take action" if he stepped on too many toes. For all we know, Schiff's threat may have worked. No Declass of a single document in any of Spygate's "5 buckets" has occurred. I can't find this anywhere, not even wikileaks twitter. If true, I am praying the Trump adm's blather via Pompeo was an attempt to throw people off. If Trump is sincere about cleaning up gov., and I believe he is, this will slowly turn out to be more transparency that destroys the left. The testimony releases of Ohr, Page etc was a declas. The dems did not want this at all, together they paint a picture, it is just a complicated picture. That's priming the well. Notice how Collins went to the house floor? Why? It's legal there - there is concern that each step might be a land mine. 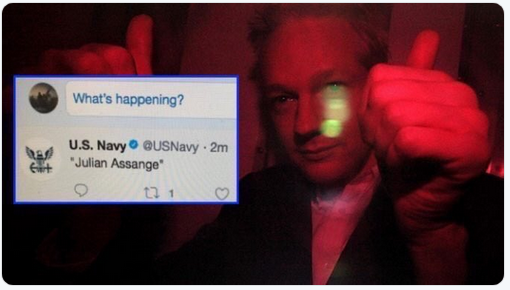 Navy tweeted it out then deleted later made a statement that is was a "search function" error. Which is what wikileaks has said a few times as well. Hard to say, hard to say but the tweet is real. I hope it was a head fake too. It really backs up the coup attempt though. then Assange releasing vault 7 Pompeo almost has to say something. Vault 7 was a pretty big leak. Still wikileaks just published it. Didn't steal it. It's the same as the Panama papers in principal.